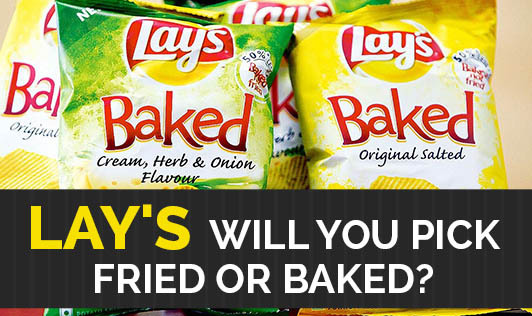 Lay's -- Will You Pick Fried Or Baked? Lay's, the yummy mouth watering chips! Lay's chips have been marketed as a division of Frito-Lay, a company owned by PepsiCo since 1965. I have seen Lay's growing to such a favorite snack not only among children but also in my own family and friend circle! With a wide variety of flavours offered today, "baked chips" has also managed to find its way into the health conscious minds. Lay's have come up with "baked chips "advertised as containing low fat and a better alternative to fried chips. The baked version of lay's claims, "At lay's we are always open to new tasty experiences, and so that's why we have put a lot of extra effort into creating a snack with a difference - Lay's baked. First up - they taste great, that's because we bake them for crispy crunchiness and exceptional taste and because they are baked they contain 50% less fat*". They also claim to have fewer calories as they are baked and so is a good choice for those weight watchers and diabetics. As it claims, the new taste, the concept of being baked and experiences are appreciated. But lays baked doesn't taste as great as lay's fried. When you compare the calories and fat between the two, you can observe that baked chips have fewer calories and fat compared to the fried one. That's great! For those weight watchers out there, keep an eye on the carbohydrates, sugar and salt content in the product as they are usually kept on the lower side for those planning to lose weight. Excessive salt intake can lead to water retention which may make it difficult for your weight to reduce. Though the protein content of the baked variety seems to be slightly higher, there are several other healthy foods from where you can get your protein! The sodium, sugar and carbohydrate content steal the possible health benefits of protein. Baked chips can be consumed by a person who is in his ideal body weight and in limited quantity. It can be consumed by weight watchers once in a while with salads. It is not advisable for a person with diabetes, hypertension and also children.